The aged elevated highway that famously borders downtown Seattle along its waterfront is set to officially close this Friday as part of the city’s multi-pronged tunnel replacement project. 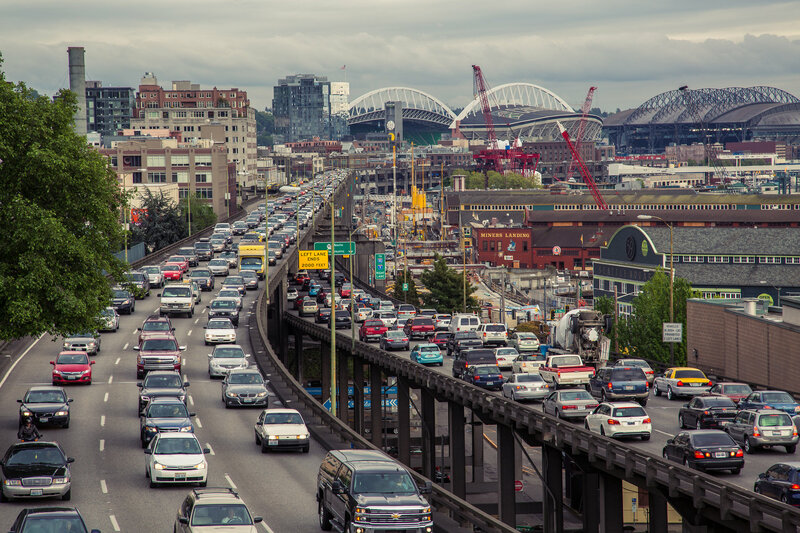 The two-mile Alaskan Way Viaduct, also known as State Route 99, has blown past its recommended lifespan and has long been considered a major hazard to the city and its drivers. Its upcoming closure marks the beginning of a new transportation system for the whole city, but the saga leading up to this point has been harrowing. 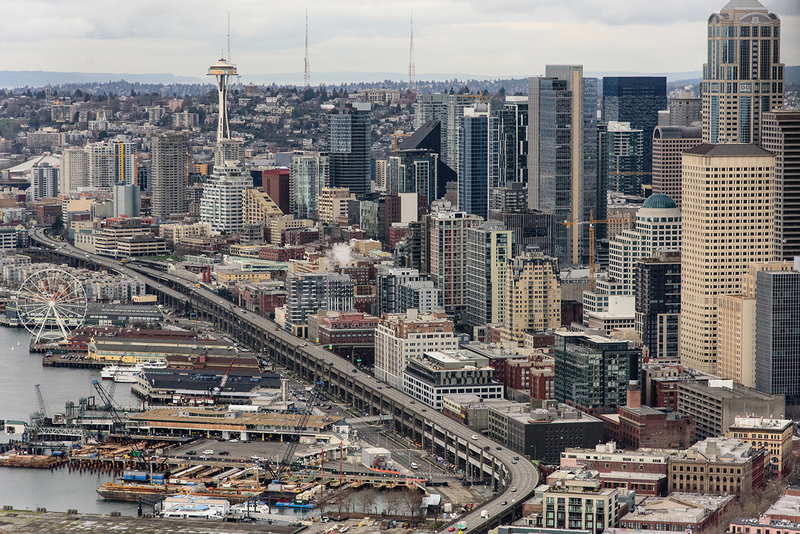 After a 6.8-magnitude earthquake struck Seattle in 2001, causing widespread panic about the then 48-year-old highway’s structural safety, the city and state began more seriously studying options to replace the viaduct. The Washington State Department of Transportation settled on a plan in 2004 that would include the build-out of a shallow, six-lane tunnel, but opposition soon arose over the project’s exorbitant cost and lengthy proposed construction timeline. After years of arguments, the most dangerous part of the highway, which sat south of downtown, was eventually demolished in 2011. Two years later, Seattle began making way for the tunnel, but the boring machine used to burrow the tunnel’s diameter broke down four months into its 1.7-mile journey underneath the city. It took another two years to repair the machine and digging began again in late December 2015. Despite more setbacks, including a large, unexpected sinkhole, the tunnel boring project was completed in spring 2017. It’s expected to open up to vehicular traffic in four weeks. Next steps include the demolition of the remaining standing viaduct and the construction of a street-level boulevard along its footprint. Dubbed the New Alaskan Way, it will line the edge of Elliot Bay. Once that’s complete, the entirely revamped highway system will stretch northbound in two directions starting from Seattle’s major sports stadiums, CenturyLink and Safeco Fields, which are situated south of downtown. The SR 99 tunnel route begins adjacent to the arenas and runs northeast underneath the city toward a northern portal near Seattle Center, the home of the Space Needle. Drivers will be able to bypass downtown through the tunnel or the waterfront street-level surface highway or simply exit onto city streets. The decision to build both an underground highway and an elongated boulevard is an unconventional approach to mid-century transportation replacement projects. Cities around the country are currently grappling with similar situations revolving around dilapidated infrastructure, but Seattle’s struggle has been on the global stage for quite some time. After all, the Alaskan Way Viaduct should have come down decades ago when experts first saw signs of damage. It’s interesting to see a major metropolis, one sitting at sea level no less, choose this multi-project plan that for years created a mess of construction chaos and citywide debate. 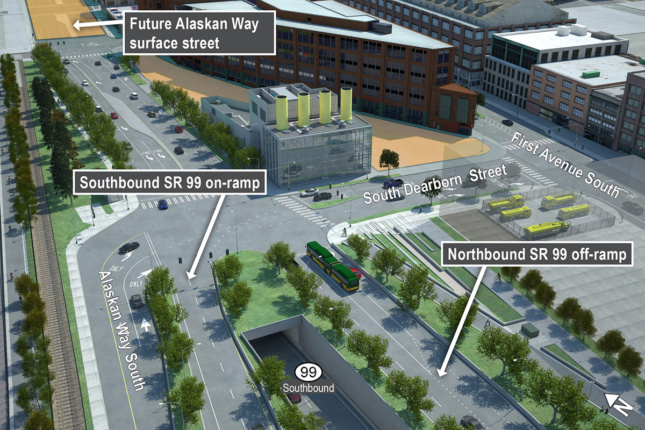 Though the pedestrian-friendly New Alaskan Way will likely do wonders to connect downtown Seattle with its industrial waterfront—a much-needed intervention—at a total of $3.3 billion it’s hard not to see this decision as both a big win for the city’s future and a big burden for its present.